As an ambassador for the San Francisco Marathon, I feel it’s my responsibility to paint an accurate picture of the race. More of a straight shooter than salesperson, I want to share the knowledge gleaned from two years (going on three) of running this race. Train on hills: There’s a reason why the Wall Street Journal calls this “the race even marathoners fear.” If you live in Kansas and the closest thing to a hill you encounter on training runs is a measly freeway overpass, you may be cursing the running gods when you hit the last hill in the Mission around mile 22. Significant hills are sprinkled throughout the course, and if you train on hills (or run in San Francisco regularly), you will fly by people who neglected hill work. But the hills aren’t THAT bad: Maybe I’m jaded because I live in San Francisco and frequently run on hilly trails in Marin, but the hills aren’t the steepest or longest ones in San Francisco. Also, what goes up must come down: you can make up time on the downhills. Walkers, be advised: There’s a six-hour cutoff, so walking for 26 miles won’t cut it. The serious nature of the race is reflected in its finishing stats: 4:34 is the average finish time, which just so happens to be my finishing time this year. The chill in the morning will burn off: Last weekend’s Hot Chocolate 15K was a perfect example of this: the morning chill will burn off and you will heat up. Layers are a mistake; t-shirts or tank tops are a must. Golden Gate Park seems to last forever: I understand why the race directors tack on so many miles in the park – the whole park can easily be closed off to cars for the race, and it’s scenic and big enough to justify several miles, but the park becomes a total head game between the first half marathon finish line and loop after loop around the park, it’s enough to make you a little disoriented and crazy. Once you’re out of the park, it’s (mostly) smooth sailing through the Haight, Mission, the Dogpatch, and the Embarcadero. 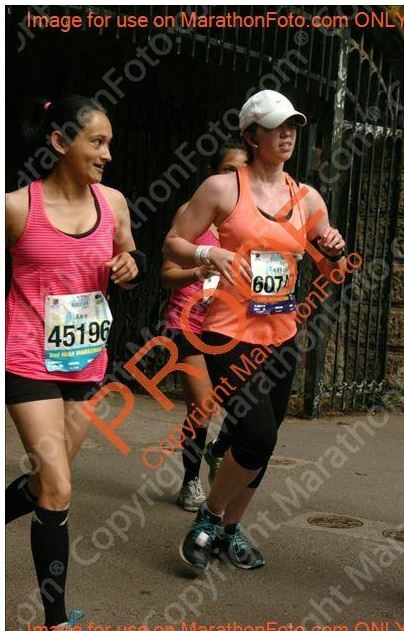 Ecstatic to be exiting GGP during 2013’s marathon. The out and back in the Dogpatch is a mind game: When you’re running in the Dogpatch before the turnaround, all you’ll be thinking is “when will this end and where is the turnaround?” Knowing that this is the last out-and-back before your victory lap past At&T Park to the Ferry Building is a bit torturous, but you’ll be so happy when you finally see the end in sight. You will most likely not earn a PR on this course (unless you’re Jesse): See mention of the hills above. The finishing times are generally 15-20 minutes slower than times on a flat course. But you will run a beautiful, scenic course in a world-class city: The impressive man-made wonders like Golden Gate Park and the city skyline juxtaposed with tranquil nature scenes like Baker Beach, the Marin Headlands, and Golden Gate Park represent what makes San Francisco beloved around the world. Whether you’re a San Francisco native or traveling internationally to run the course, the San Francisco Marathon is challenging, rewarding, and, most importantly, fun. Awesome. I’m definitely running this in the next couple years. I’ve love to run this race. I used to live in the US, I studied in New Mexico and visited San Francisco often. I have very fond memories of the city and running a marathon there would be just wonderful I’m sure. Your review makes it sound even more tempting – I like the unusual, tougher races (I find very flat courses to be a poison challice in a way, as you just pound the same muscles over and over! ).